Samples from 80 brands of beef, pork, chicken and turkey from retail stores across the country (Los Angeles, Washington D.C., Flagstaff, Arizona, Chicago, and Fort Lauderdale, Florida) were tested. It was found that 47 % of the samples were contaminated with strains of the Staph bacteria, and that 52 % of the bacteria in the samples were resistant to nine different kinds of antibiotics. The source of the bacterial contamination were likely the food animals themselves. The American Meat Institute Foundation, however, has refuted TGen’s report and issued their own statement to the effect that heat in cooking kills the Staph bacteria in meat and poultry: “Despite the claims of this small study, consumers can feel confident that meat and poultry is safe,” stated James H. Hodges, the organization’s president. Nevertheless, the TGen research noted that cross contamination can occur in the kitchen through improper handling of the meat and poultry, and potentially still pose a health threat. Although research is still ongoing as to what these findings can mean to the public, the mere risk of drug-resistant superbugs like Staphylococcus aureus in the public’s very food remains alarming. This is especially true because of the startling increase in the last decade of Staph infections in the U.S. and around the world. In 2003, an estimated 12 million doctor and emergency room visits for Staph-skin and soft tissue infections were reported in the U.S. In addition, according to the Center for Disease Control in 2005, MRSA (methicilin-resistant Staphylococcus aureus) caused an estimated 94,000 “invasive life-threatening infections and almost 19,000 deaths.” In England alone, between 2003-2004 there was a 548% increase of deaths in hospitals from MRSA. Currently, more people die from MRSA infections than from the AIDS virus. With every year the situation is growing worse as doctors are running out of effective pharmaceutical antibiotics with which to combat the drug-resistant Staph bacteria. Even raising greater concern is the fact that the Staph illnesses are more and more occurring outside the usually hospital setting or in immune-compromised patients, but are increasingly striking healthy individuals. The indiscriminate and improper use of pharmaceutical antibiotics has created the Staph superbug, which may yet turn into the MegaSuperBug, with no hosptial-pharmaceutical remedy. The good news is that the simple-not-so-simple herb, Allium sativum, our friend Garlic, has been shown in numerous studies in India, the United States and in other countries to be effective against Staph infections as well as numerous other bacteria. And, unlike laboratory pharmaceutical antibiotics, to which bacteria can become resistant or immune, these microorganisms, including S. aureus, cannot become immune or resistant to garlic. While the medical community in the U.S. is not widely versed in the health benefits of garlic and other herbs, and specifically for fighting infections such as caused by Staphyloccocus, doctors in Europe and other nations recognize the healing power of garlic and prescribe it to their patients. 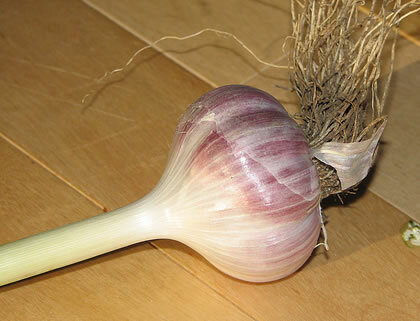 As an alternative remedy garlic is none the less becoming a herb of choice in treating a multitude of diseases. Ask your doctor or alternative medical professional how to use garlic for a Staph infection. Cook all meat and poultry thoroughly. Take special care when handling and preparing meat and poultry to prevent cross-contamination in the kitchen. And, as a further preventative, use garlic everyday in your food, soup, sandwiches or salads to strengthen your immunity and keep all and any infections at bay.